We may not have flying cars or teleportation devices yet, but we do have some incredible technologies that are helping to make the world a better place. Every year, the Tech Awards recognizes individuals and organizations that are doing just that – significantly improving human conditions in the categories of environment, education, health and economic development through tech. Some of these technologies are completely new inventions, and others are innovative uses of existing technologies. Here are the 10 laureates for 2014 who will be honored in the Tech Awards’ Gala on November 13. Read on to find out how these innovations are tackling some of the world’s biggest issues. Inventive Power’s specially designed solar panels. Photo credit: Inventive Power. The problem: Natural gas is the most common fuel source for generating industrial thermal energy, but many Latin American countries don’t have widespread natural gas distribution systems. Both natural gas and a common alternative, liquefied petroleum gas (LPG), are fossil fuels whose combustion generates CO2, contributing to global climate change. The solution: Inventive Power created a specially designed solar thermal energy collector, to generate high temperature steam for electrical power production. The system can fit on the roof of most industrial facilities, and reduces fossil fuel consumption by up to 80%. Impact: For the average customer, an installed system will reduce LPG consumption by more than 50,000 tons over the next 5 years – saving millions of dollars – and reduce CO2 emissions by over 130,000 tons over the same time period. Community members look at the dangerous block of sulfite in their town. Photo credit: Source International. The problem: Extractive industries (e.g. mining and drilling) have greatly increased activities in low-income countries in Latin America in recent decades. Communities and indigenous peoples living near mines and drilling sites often suffer severely from pollution, but may have limited tools to demonstrate that contaminants such as heavy metals are present in their water, air, and soil and are responsible for their health problems. The solution: Source International offers poor communities in a suite of scientifically-validated testing technologies to examine their water, air, and soil for a variety of chemical contaminants. Community members have the sampling and data analysis they need to seek justice from polluters. Impact: To date, Source International has worked with 15 communities in Mexico and Latin America. Successes have included changes to mining laws in Honduras, implementation of clean-up plans in the Peruvian Amazon, and millions of dollars in compensation for community members in Carrizalillo, Mexico. Problem: 775 million people in the world are illiterate, and as the population grows, the problem is worsening. Solution: Worldreader uses inexpensive e-readers with extended battery life to provide books to children and young people. The program support the e-readers with extensive training and capacity building for teachers, facilitators, and librarians, and features fun activity plans that are designed to nurture a love for reading. Impact: To date the project has reached more than 200,000 people in 27 countries, providing them with more than 5,000 book titles in 23 languages. Customizing education for efficient learning. Photo credit: Gooru. Problem: K-12 teachers often have little flexibility in addressing each student’s needs within the school day, and are forced to adjust their instruction to the “average” student in their classroom. Technology makes it possible for teachers to personalize learning tools, but finding the right tools from the vast number of resources now available online can be intimidating or overwhelming. Solution: Gooru provides a free learning facilitator for teachers to easily customize instructional content using digital collections from a catalog of educator-vetted, standards-aligned content. Students are more engaged by personalized learning experiences, and teachers are able to track their progress through data analytics. Impact: Gooru has been adopted by educators in all 50 states in the U.S., and over 140 countries. Setting up a biogas tank. Photo credit: PAK-Energy Solution. Problem: More than 16 million rural families in Pakistan do not have access to clean-burning fuels for cooking and heating, resulting in health problems for women and infants, environmental degradation and increased poverty. Solution: PAK-Energy, headed by Ali Raza in Lahore, Pakistan, has developed a small, sustainable domestic biogas unit that generates sufficient biogas to satisfy a family’s cooking and heating needs, while reducing or eliminating fuel purchases (thus saving money), reducing waste production, and producing non-toxic organic residues that can be sold as fertilizer. Impact: PAK-Energy has installed seven pilot projects in Lahore, and has plans to scale to more than 25,000 units in 5 years. Traveling through rough roads to bring vaccines to rural parts of Haiti. Photo credit: Living Proof. Problem: Last year, nearly 20 million children did not receive immunizations and close to 2 million people died from vaccine preventable diseases. One factor contributing to this is the need to refrigerate most vaccines, which is not only expensive, but difficult to maintain in remote rural areas. Solution: Nanoly is developing a biomaterial that encapsulates and protects thermally-sensitive biologics during storage. Nanoly’s primary customers will include pharmaceutical companies and non-profit vaccine distributors such as UNICEF. The hydrogel product is expected to go on the market in 2017. Impact: The hydrogel product is expected to go on the market in 2017. An Operation ASHA outpost. Photo credit: Operation ASHA. Problem: Tuberculosis (TB) is a global health problem focused on the poorest people of the world. TB is difficult to treat effectively in this population, given limited access to healthcare and the long course of antibiotics necessary to cure the infection. Solution: Operation ASHA created the eCompliance project to combine biometric technology, deployed by community health workers to ensure continuous and effective delivery of antibiotics to TB patients in India. Fingerprint log-ins allow nurses and health workers to accurately identify every patient, and record their ongoing compliance with treatment. Impact: OpASHA has facilitated treatment of more than 30,000 TB patients to date, with over 5,000 patients currently under care through 159 clinics in India. Problem: More than 2 billion people in low to middle income countries have limited access to safe surgical services. 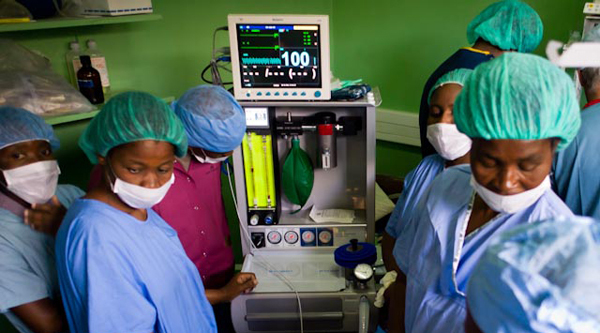 Unreliable electrical power, poor equipment maintenance, and a lack of compressed oxygen can render safe anesthesia delivery impossible using equipment designed for wealthier countries. Solution: The Universal Anesthesia Machine (UAM) is a robust delivery system able to operate when necessary without compressed oxygen or continuous grid power. The UAM is easier to use and much less expensive than conventional anesthesia delivery systems, and has been rigorously validated in healthcare settings from the UK to Sierra Leone. Impact: More than 80 UAM’s are currently in use in hospitals and clinics in 18 countries, with 400 clinicians and technicians trained in their use. Problem: Approximately 75% of the population of West Africa are rural subsistence farmers. Banks and microfinance institutions focus on urban clients and have strict lending requirements. With only 7% of the population having access to a regular bank account, it is very difficult for most farmers to save money for fertilizer and seed in preparation for the planting season. Solution: The myAgro technology platform enables farmers to enroll at harvest time, plan how many hectares they want to plant the following season, and open a mobile savings layaway account to save up to buy enough fertilizer and seed to meet those goals. Because myAgro buys high-quality seed and fertilizer in bulk, farmers pay less for their inputs. They also get access to expert advisors. Impact: myAgro currently has 5100 farmers enrolled in Mali and Senegal. Using their unique client ID, farmers in remote villages can add money to their account at any time simply by sending an SMS message from a mobile phone. Children line up to use a Sanergy toilet. Photo credit: Sanergy. Problem: In Kenya, 8 million slum residents lack access to adequate sanitation. Diarrheal diseases alone, spread by poor sanitation, kill nearly 1.6 million children each year worldwide. Solution: Sanergy builds and franchises a network of small-scale, high-quality sanitation centers featuring their innovative “Fresh Life Toilets”. These centers are run by local entrepreneurs and receive ongoing operational support. Waste from the toilets is sealed into 30L cartridges, collected, and delivered to processing centers that convert the material into higher-value products: biogas (sold as cooking fuel) and organic fertilizer for farmers. Which innovation did you like best? Tell us in a comment below. Tune into a live stream of the Tech Awards Gala 2014 on November 13, 7:40 PM ET, to see these incredible innovations being honored for their contributions to humanity.